With Thanksgiving tomorrow (I can’t believe it’s here already), I’ve been scouring the internet for new recipes – specifically side dishes. I’m not sure why, but every year I like to be adventurous with my dinner and try something new. This year my hubby and I will be celebrating a big Thanksgiving dinner with family out of town, but on Sunday I’m planning a little Thanksgiving dinner for him and I. Below are some of the recipes I’ve been eyeing. 1. 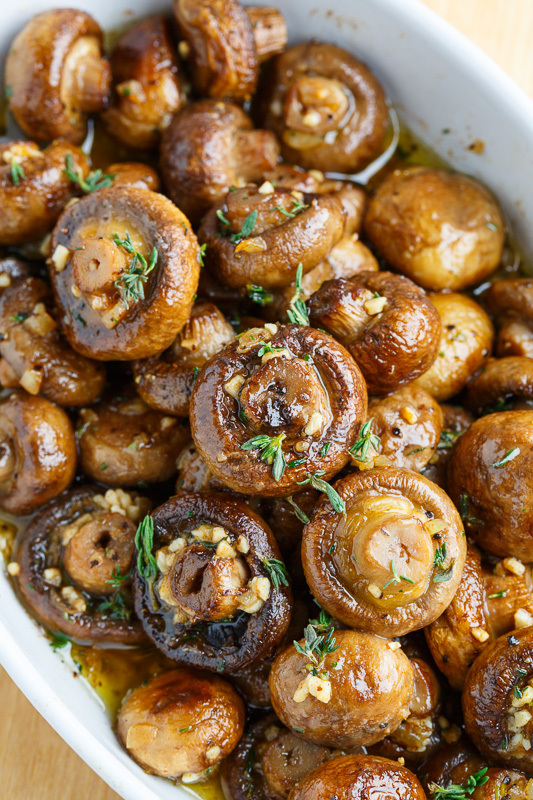 Toss the mushrooms in the oil, salt and pepper, place on a baking sheet in a single layer and roast in a preheated 400F oven until they start to caramelize, about 20 minutes, mixing half way through. 2. Cook the butter over medium heat until it starts to turn a nice hazelnut brown, remove from heat and mix in the garlic, thyme and lemon juice. 3. Toss the roasted mushrooms in the browned butter and season with salt and pepper to taste. 1. 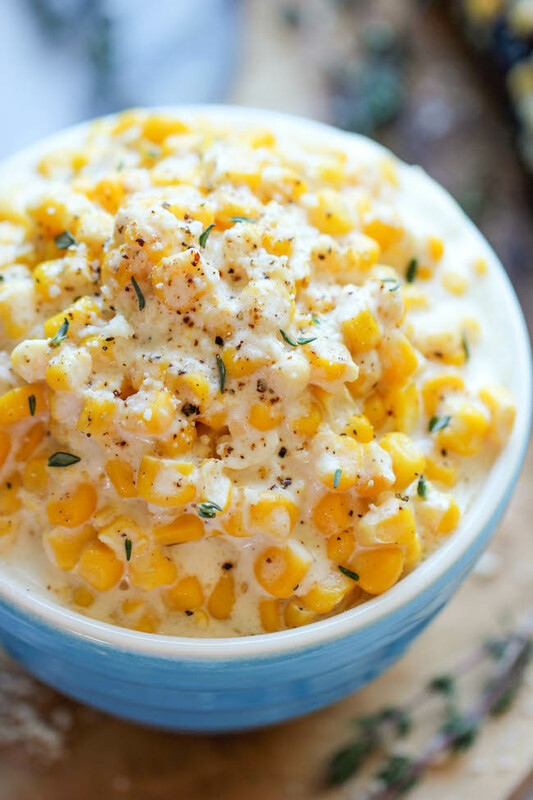 Place corn into a slow cooker. Stir in milk, sugar and pepper until well combined. Without stirring, top with butter and cream cheese. Cover and cook on high heat for 2-3 hours. 2. Uncover and stir until butter and cream cheese are well combined. Cover and cook on high heat for an additional 15 minutes. 1. Preheat oven to 400 F degrees. Spray a baking dish, I used a 9×13 inch, with cooking spray and set aside. 2. Snap the end pieces off the asparagus and place them in the baking dish. Add tomato halves too. I placed the asparagus at one end and tomatoes at the other end. Season generously with salt and pepper and sprinkle the Parmesan cheese over asparagus and tomatoes. Place in oven and bake for about 15 minutes or until asparagus softens a bit and begins to get brown. 3. In the meantime add the balsamic vinegar to a small sauce pan and cook over medium heat for about 15 to 20 minutes or until it reduces and starts to thicken. 4. Drizzle some of the balsamic reduction over the roasted asparagus and tomatoes and serve warm. 1. Bring a large pot of salted water to a boil and add the green beans. Blanch (cook) the green beans for 1-2 minutes until bright green and then, using a slotted spoon, transfer the beans to a bowl of ice water. (This will stop the cooking process and keep your beans from losing their bright green color.) Drain in a colander and set aside. 2. Heat the olive oil in a large skillet over medium heat and add the shallots. Cook the shallots until softened and translucent. Add the butter and cook until melted. Stir in the green beans and cook for 4-5 minutes. Transfer the green beans to a bowl. 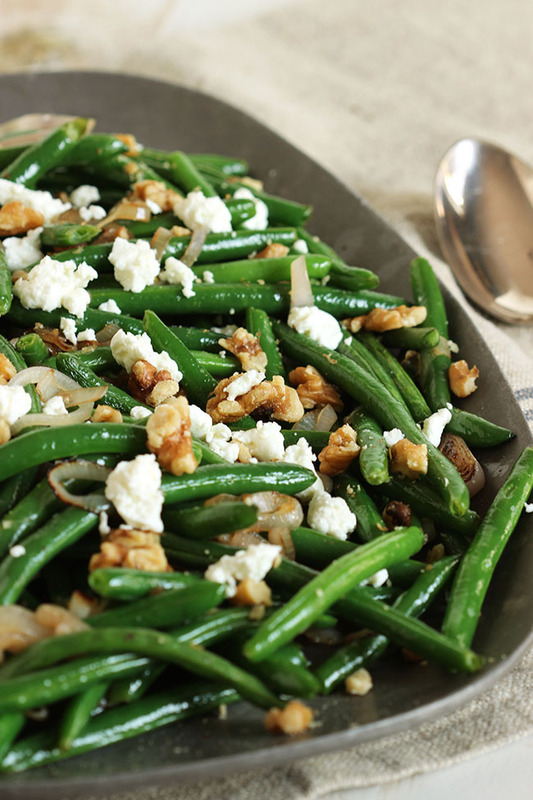 Toss the beans with the salt, pepper, goat cheese and walnuts. These all look sooooo good! I haven’t decided which one I want to make yet! What are some of your favorite side dish recipes? Please share below in the comment section!